Transforming our World: the 2030 Agenda for Sustainable Development" including its 17 Sustainable Development Goals (SDGs) and 169 targets was adopted on 25 September 2015 by Heads of State and Government at a special UN summit. The Agenda is a commitment to eradicate poverty and achieve sustainable development by 2030 world-wide, ensuring that no one is left behind. The adoption of the 2030 Agenda was a landmark achievement, providing for a shared global vision towards sustainable development for all. The journey started in June 2012, with the "Rio+20" Conference on Sustainable Development, where Governments decided to develop global Sustainable Development Goals, building on the Millennium Development Goals but also including issues such as natural resources management, sustainable consumption and production, effective institutions, good governance, the rule of law and peaceful societies. The reports of the Open Working Group on Sustainable Development Goals and the Intergovernmental Committee of Experts on Sustainable Development Financing formed the basis of the final Agenda package, through a series of intergovernmental negotiations in partnership with major groups and stakeholders, ensuring the broadest possible ownership of this new Agenda. In the run-up to the adoption of the 2030 Agenda, the Commission worked closely with the Member States to ensure an ambitious global outcome. It issued a first Communication “A decent life for all: ending poverty and giving the world a sustainable future” in February 2013. It was followed by Council Conclusions on “An overarching post-2015 framework” in June 2013. A second Communication “A decent life for all: from vision to collective action” was issued in June 2014 and was followed by Council Conclusions on “A transformative post-2015 agenda” in December 2014. On 5 February 2015 the Commission issued its third Communication "A Global Partnership for Poverty Eradication and Sustainable Development after 2015" which puts forward ideas on the appropriate enabling policy environment; on financing – public and private, national and international; and on monitoring and accountability. This was followed by Council Conclusions on "a global partnership for Poverty Eradication and Sustainable Development after 2015" on 26 May 2015. The 2030 Agenda itself consists of 4 sections: (i) A political Declaration (ii) a set of 17 sustainable Development Goals and 169 targets (based on the report of the OWG, with some small modifications) (iii) Means of Implementation (iv) a framework for follow up and review of the Agenda. The scale, ambition and approach of the Agenda are unprecedented. One key feature is that the SDGs are global in nature and universally applicable, taking into account national realities, capacities and levels of development and specific challenges. All countries have a shared responsibility to achieve the SDGs, and all have a meaningful role to play locally, nationally as well as on the global scale. 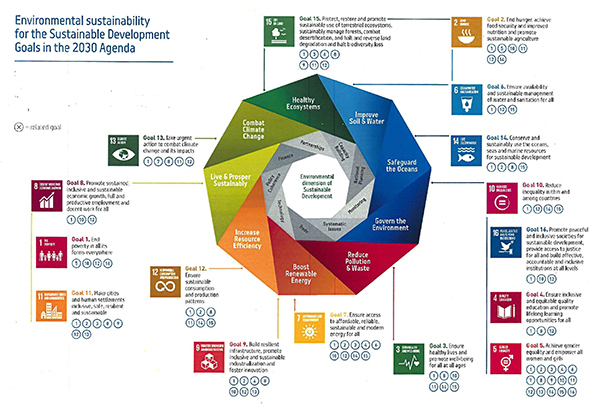 In addition, the 2030 Agenda integrates in a balanced manner the three dimensions of sustainable development – economic, social and environmental. The 2030 Agenda is also indivisible, in a sense that it must be implemented as a whole, in an integrated rather than a fragmented manner, recognizing that the different goals and targets are closely interlinked. The 2030 Agenda is based on the concept of global partnership, supported by a comprehensive approach to the mobilisation of all means of implementation, and is complemented by the Addis Ababa Action Agenda, which is an integral part. Moreover, in order to ensure progress and long-term accountability, the 2030 Agenda includes a strong follow-up and review mechanism which will allow all partners to assess the impact of their actions. At global level, this is overseen by the High level Political Forum on Sustainable Development, which meets at UNHQ every year to track progress.